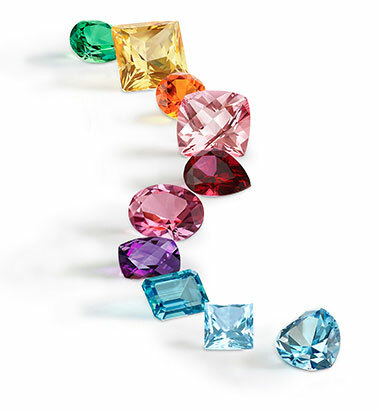 Founded in 1965, the Swarovski Gemstones Business leads the field worldwide, employing only the finest raw materials and the strictest manufacturing standards to conceive our Genuine Gemstones and Created Stones. We cut and polish exclusively on our own company premises, guaranteeing outstanding results in shape, color, and brilliance, and meeting the topmost social and environmental standards. Our dedication and craftsmanship are reflected in each and every one of our unique stones, providing creative diversity and individual product solutions for a host of international brands, designers, and manufacturers. At Swarovski, our ultimate aim is to see your product truly shine. As a partner of our ‘ingredient branding program‘, you can benefit from increased consumer confidence and a wide range of strategic business services. Our exclusive package comes with a collection of distinctive labels, offering you the full marketing potential of the Swarovski brand for all of your communication activities: ‘Made with Swarovski Zirconia’ and ‘Made with Swarovski Gemstones’ serve both as a symbol of authenticity and a promise of exceptional quality. MQ – STANDARD QUALITY Swarovski MQ Genuine Gemstones are a composite of stones that are excellent in machine cut, brilliance, and polish, including stones with minor flaws, e.g. slight defects in facet symmetry, which are only visible under a 10x magnification loupe. MQ stones have a clarity range from eye-clean to eye-visible. All of our MQ products are suitable for Ingredient Branding projects. FQ – SPECIAL REQUIREMENT Swarovski FQ Genuine Gemstones are excellent in machine cut, brilliance, and polish. Each stone is cut to achieve perfect facet symmetry, and is color sorted. Our FQ stones are free of visible color zoning, allowing for only the slightest inclusions. FQ stones have no defects visible to the naked eye, and only minor flaws when viewed under a 10x magnification loupe. Each of our Genuine Gemstones reflects the quality, creativity, and technical precision that the name Swarovski has come to stand for. Our exceptional stones are skillfully cut from raw, natural materials, which in turn define the limitations and supply of our selected gemstone rough. Whilst our product range is vast and varied, the supply of our listed items is subject to market availability.